Yes, only one month to go until the Big Craft Event at the Lincolnshire Showground (12th November 2017 if you'd like to come along) where I am taking my felt work. I am almost there but just have a few things to finish off and sort out. I have made a banner for the front of the stall, and have been very lucky as my talented illustrator friend Rachael has designed a happy sheep logo for me and I have had it made up into a stamp for my packaging materials. It is a very happy sheep! I have added a watermark to the above photos, which is not something I usually do on my blog, but I decided it would be sensible to protect that logo. I know that choosing a name for a hobby, which will work on the internet, as well as any products which you hope to sell, is a difficult process. I settled on 'Feltabulous' in 2009, for this blog and any other website/packaging etc. I have discovered that other people have also chosen this name, in America and Australia. This is not too much of a problem as they are in other countries and their work is not like mine. 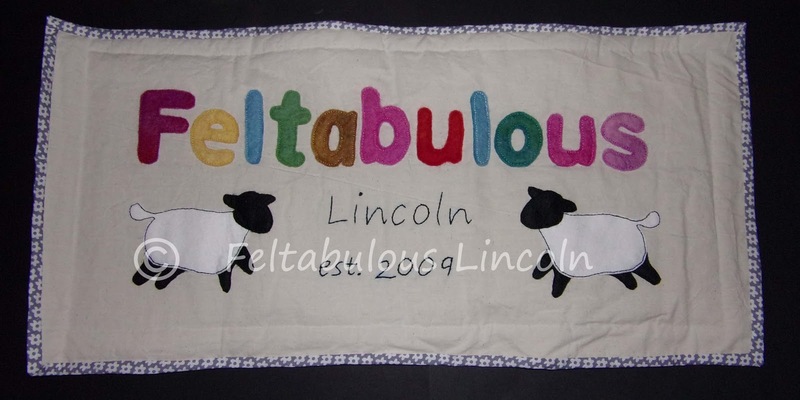 However, earlier in the year, I discovered that there is someone not too far away from me, also in Lincolnshire, who is using the name, albeit with a variety of upper and lower case fonts and mainly producing needle felted work. I wouldn't mind so much if it was in the UK, but away from Lincolnshire. I got in touch and asked if we could find a way to distinguish our names, so that our respective customers would not be confused. Unfortunately, I have had no response. I have added 'Lincoln' to my packaging in the hope that this will make my work synonymous with me. 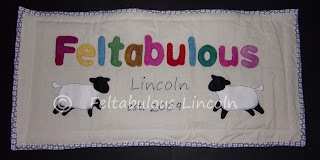 I hope you can resolve the naming issue - and love your banner and your happy sheep. I hope the Craft Event is a huge success - and that you are not too tired to enjoy it. Thanks, EC. I am really attached to my happy sheep and am going to make a polymer clay name badge for myself too, using the stamp as a mould. The naming issue is as resolved as I think it can be without any dialogue, although I will try to make contact again. 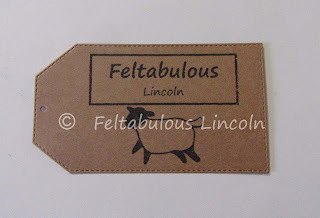 I really like 'Feltabulous' and am loath to change it too much. If the craft fair is successful, I am considering opening an internet shop. 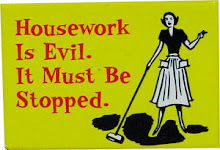 There still seems to be a lot of little things to do for the craft fair, but I am hopeful it will all get done. Thanks, Cheryl. Rachael is very clever and drew exactly what I needed. I think there are around 130 stall holders at the Craft Event, so there will be lots to see. It would be lovely to see you if you do come - come and say hello!